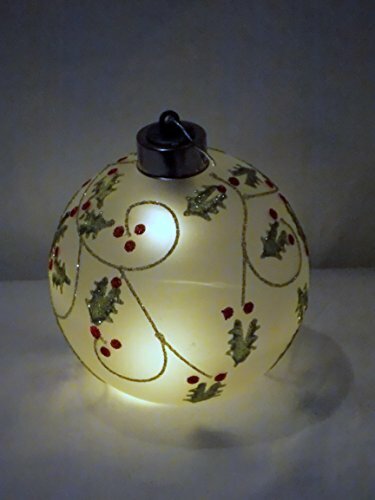 This Christmas Ball is made of Glass. The glass is clear and has glittered Holly Berry Leaver and Red Berries designs on it. There is a switch on the top to turn on the light.This takes 3 LR44 coin batteries that are included. This piece is so beautiful. This is not a hanging ornament. This is free standing so it can be placed anywhere. The approximate dimensions are 4" in diameter. Make this a wonderful piece a part of your holiday decorations. If you have any questions about this product by Pier One, contact us by completing and submitting the form below. If you are looking for a specif part number, please include it with your message.